Teachers and pupils enjoyed glorious weather conditions during the annual House Matches on Tuesday 29 May as Fane and Whitewater emerged victorious in football and netball respectively. Following a round robin football tournament, Fane and Whitewater ended with the same number of points and an equal goal difference and so players had to settle the contest with a penalty shootout in front of a large number of spectators behind the goal - and it was the players from Fane that kept their nerves to win the trophy. 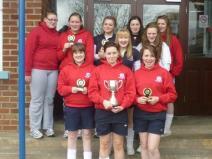 Despite the heartbreak of the penalty kick competition, Whitewater did have something to cheer about on the day when their netball team won the round robin tournament. The points won by the individual houses will be added to the current totals that have been awarded for other events and positive behaviour during 2011/12 - with the overall winning house being announced at Prize Night in early October. A big thank you to the PE Staff of Mr J Black and Miss L Anderson for their organisation and well done to all the participants particularly in the sweltering conditions. School will finish on Friday 1 June (3pm) for pupils following a Jubilee Barbecue - tickets are priced £3 and are available at the school office. 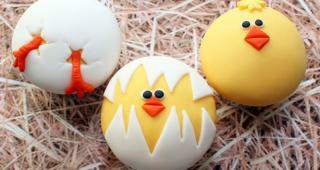 School will be closed on Monday 4 June and Tuesday 5 June for the Jubilee Bank Holiday. Only Year 11 and 12 pupils completing the GCSE Maths exam on Wednesday 6 June should attend school due to staff training that has been organised by Newry & Mourne Area Learning Community. As the summer weather arrived, our Year 10 Bronze Duke of Edinburgh group finally made it into the Mournes! The day was enjoyed by everyone involved; including those who ended up a little wet and muddy! 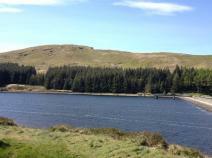 Spectacular views of Lough Shannagh, the Silent Valley Reservoir and Fofanny Dam can be seen amongst the photos below. Jubilee Olympics Sub-Committee Meeting – the purpose of this meeting is to plan for the forthcoming Jubilee Olympics event. Please attend if you are willing to help – everyone welcome. 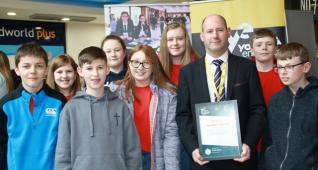 Many congratulations to the business ‘Snow White and the Seven Dwarves’ for getting through to the final of the Ulster Bank Northern Ireland Schools Financial Capability Awards. 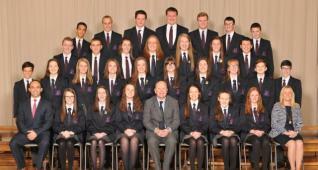 The group will be attending the awards ceremony at Queens University, Belfast on 31st May with Principal Mr Mullan and Mrs Alexander – keep your fingers crossed as we have got through to the final 3! 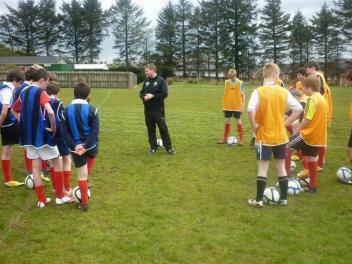 The footballing boys from the school were put through their paces last Wednesday by top IFA coach Steven Millar. He was impressed by the standard considering the school was situated in such a rural area and future sessions are in the pipeline. 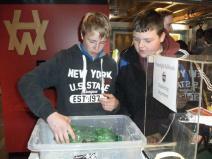 A good turn out of parents and pupils attended the recent GCSE Art and Design Exhibition in the Art deaprtment. Teacher Miss Johnston would like to thank all those who attended and also the pupils who worked hard at putting together their work for the display. 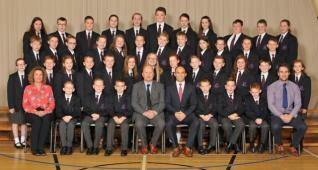 On Thursday 10th May Year 9 pupils Gemma McDowell, Laura McNiece, Jim Preston, Aaron Dickson, Jillian McCarragher, Colin Mc Bride, Andrew Geary and Andrew Hamilton were filmed as part of their entry into the Ulster Bank’s Financial Capability Awards. The group started up their own business entitled ‘Snow White & the Seven Dwarfs’, learning entrepreneurial skills and qualities as part of the employability section of Learning for Life and Work (LLW). 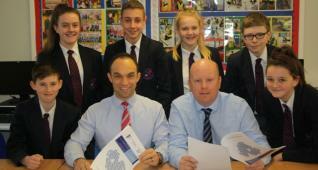 This enabled the pupils to be shortlisted to the final three groups of this high profile competition. The (LLW) teacher, Mrs Alexander, and the Principal were also filmed to give the judges an overview of the Quick Start programme and how it benefits our pupils. Congratulations to all who took part and we are all looking forward to learning the outcome of the competition at an awards ceremony at Queen’s University, Belfast on 31st May. Newtownhamilton brought a squad of 20 Athletes to the Antrim Forum yesterday to compete in the district ‘D’ Championships. 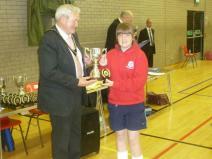 All competitors did their school proud in horrendous weather conditions. Matthew Leyburn and Natasha Kennedy deserve a special mention as they were placed in the medal positions for the high jump, Natasha also made it to the final of the 100m only to narrowly miss out on the medals by 0.1 of a second! 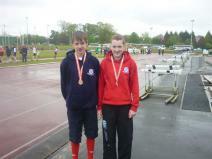 Both athletes will go on to represent the school in the Ulster Finals to be held at a later date. 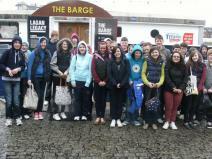 Year 10 History pupils travelled to Belfast on Thursday 10 May and boarded the Belfast Barge which is permanently moored behind the Waterfront Hall. 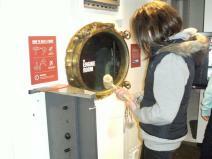 It is part of the Lagan Legacy Heritage Project which uses physical artefacts and oral history recordings to tell the story of Belfast's maritime history. 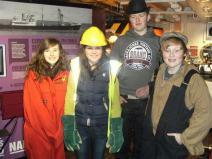 The pupils were able to take part in lots of engaging activities, even seizing the opportunity to dress up in old shipyard workers' clothes without any prompting! They were also able to develop their interview skills by hot-seating a special guest called George, an old Harland and Wolff shipyard worker. He shared his memories of life in the shipyard and encouraged the pupils to chat to their grandparents and elderly neighbours about life in the past - our living history! Matthew Rowland shone on the day and was our top historian as he impressed us all by asking lots of insightful questions. This experience provided links across the curriculum, particularly between Geography and LLW and built upon the pupils' prior historical knowledge. 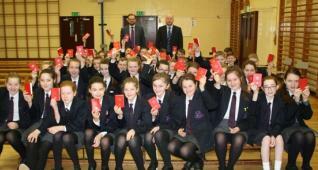 In October Year 10 pupils completed a successful group enquiry and class presentation on the Titanic. Pupils attending Scripture Union enjoyed a visit from Marcus Somerville (pictured right) from Child Evangelism Fellowship. He got pupils to consider the purpose of 4 different tools and then challenged them to consider what their purpose in life is. We look forward to his follow up visit next Thursday. 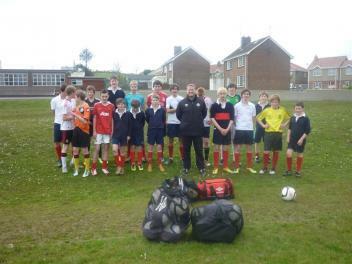 Congratulations to Daryl Johnston (pictured right) on his selection for the N Ireland Under 14 Elite Squad. Daryl begins a 5 week training programme next week with a possible trip involving match fixtures at a later date. Meanwhile, congratulations also goes to Year 11 pupil Ryan Walker following his selection to the N Ireland Cerebral Palsy Senior Squad. Ryan will be travelling to Barcelona in early June to play in an international tournament involving Catalonia, Canada, Denmark, Finland and Holland. A picture of Ryan (front row, no. 6) and his team mates can be found by clicking here. 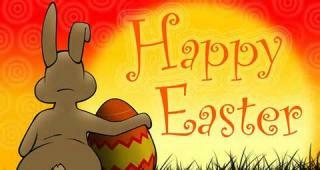 Best wishes to both Daryl and Ryan for the coming weeks. 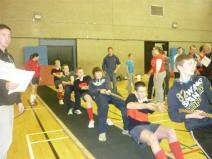 Year 11 boys and girls took part in the annual Secondary Schools Tug of war Championships at Craigavon Leisure Centre yesterday, with the Girls team emerging victorious in the final against Craigavon Senior High School. The Boys team also put in a battling display on the day before losing out to Devenish College in the semi-final but it was the Girls that brought the cup back to Newtownhamilton. Well done to the winning team of Rae Acheson, Danielle Armstrong, Louise Clarke, Jessica Haffey, Kimberley Haffey, Annaleigh Jackson, Lois McNiece, Rebecca McNiece, Jodie Riddle and Rebecca Ritchie. Pictured are pupils from Year 11 and Year 12 with their teacher Miss V Hadden who took part in the UKMT Intermediate Mathematical Challenge 2012 in February. Missing from the photograph are Kathryn Leyburn and Dean Govan. Everyone performed very well and a special mention goes to Ashleigh Henry (pictured back left) who was placed best in school and received a Gold certificate. All Year 10 pupils and the Year 12s studying the Double Award Science course went to Gosford Forest Park on Friday 4 May to carry out habitat studies. An invitation was also extended to the P6 and P7 pupils from our contributory primary schools of Cortamlet, Drumhillery and Newtownhamilton, who were able to engage in learning in the STEM Module (pictured below). Launched in 2009, the STEM Module is a mobile laboratory and workshop equipped with everything required to deliver a state of the art learning experience to schools across the province. 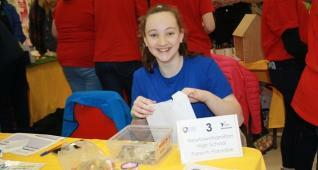 An enjoyable day was had by both our pupils and the primary school pupils - with a lot of bug-hunting going on! After a gruelling 2 month Badminton competition, the partnership of Emma Henderson and Jeffrey Martin proved to be too strong for the rest of the field within school. In a tense final of extremely high quality, the pair held off the challenge from Amy Knight and Matthew Harrison in a best of five game match (3-1), to lift the trophy. 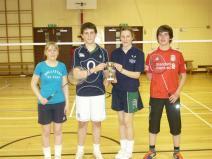 Badminton in Newtownhamilton High School is going from strength to strength with some very talented players coming through. In addition to extra curricular practice, pupils are also developing their skills through attendance at local clubs in Armagh and Castleblaney. 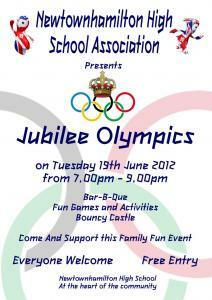 The vibrant School Association are hoping to build on the success of previous events (Christmas Fayre, Community Fitness Class and Can't Cook, Won't Cook) this academic year by hosting a Jubilee Olympics evening on Tuesday 19 June 2012 at 7pm. Not only will the evening include the finals of the track and field events from Sports Day but a wide range of fun style games will be held for both pupils and parents to participate in. A barbeque, bouncy castle and many other activities will ensure a fun filled evening for all the family - so come along and support this community event, everyone welcome. School Association Members willing to contribute to the organisation of this event should contact the school office. Last Saturday (28/04/12) saw the Year 12 Silver Duke of Edinburgh group head to The Mournes to complete their Practice Expedition. The weather was mostly good; however, sleet and hail mixed with strong winds made Sunday evening quite memorable! Well done to all the girls for getting through it! 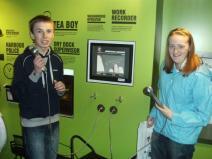 Our Year 11 Duke of Edinburgh groups took part in the inaugural Mourne Mountain Adventure at the weekend. The event comprised a hike in the mountains followed by a boat journey across Dundrum Bay where, once landed, they then faced a number of challenges at Ballykinler Training Camp. 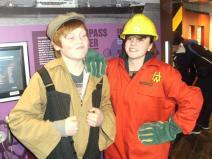 A thoroughly enjoyable time was had by all, including Lois McNiece, who was interviewed ‘live – via. satellite’ by BBC Radio Ulsters’ Your Place and Mine programme.